"The Yamaha YDP223 isn't America's best-selling digital console piano by accident." Today, we rolled up our sleeves and explored the Yamaha YDP223. It isn't America's best-selling digital console piano by accident. From its high quality voices, 64 notes of polyphony, 88-key graded hammer technology, to its two-track sequencer, and stylish console piano looks, we'll take you inside the Yamaha YDP223 digital piano. Note: If you've read our September 27, 2007 review of the P140, you will notice the YDP223 is very similar. A lot of the same content will be repeated here; however, we will also point out some unique features that are only found on the Yamaha YDP223 and will be italicized for convenience. The first thing we noticed about the Yamaha YDP223 is its console piano look complemented by the dark satin walnut finish—a beautiful look for the home. Next, we noticed the traditional three-pedal layout on the YDP223 which is quite solid and firm and appear to be of the same quality and style that is used in their acoustic pianos. The YDP223 measures in at 53-15/16" long, 20- 3/8" deep, and, 33-7/16" high, making it a compact instrument that can fit in any apartment or house without being too big. The YDP223 weighs in at about 112 lbs, which may seem a bit heavy, but considering its wood cabinet design and solid construction, this did not surprise us. When we sat down to review the Yamaha YDP223, we were surprised by the very natural keyboard feel. Yamaha calls this their Graded Hammer Technology (GH). In a nutshell, like a real piano, the weight of the keys on the bass side is heavier than on the treble side. The result? A fantastic feeling digital piano that articulates the nuances of your playing dynamics while building confidence. Now, for some specs: The Yamaha YDP223 has 14 different voices that range from pianos, electric pianos, organs, to a harpsichord, choirs, and, strings. The YDP223 has 64 voices of polyphony which mean the maximum number of simultaneous voices that can be played at once without any voices cutting out. For playing solo piano, 64 voices will be plenty however, if you have two voices layered, say strings and piano, then your maximum polyphony will be 32. The YDP223 also has 50 preset songs plus music book to practice with, a two-track sequencer, timbre selector, reverbs, effects, touch control setting, music rest, and, a key cover to keep your keyboard dust-free. The heart of the Yamaha YDP223 is the piano sounds—and they are good. Yamaha used dynamic stereo sampling to achieve this by recording a real Yamaha concert grand at three different dynamic levels: soft, medium, and hard playing styles while capturing the stereo ambience. There are two acoustic piano programs on the YDP223: the Grand Piano 1 and Grand Piano 2 programs. Grand Piano 1 seemed to be best suited for classical and jazz pieces while grand piano 2 was a bit brighter in timber and was better suited for rock and pop. A wonderful feature about the Yamaha YDP223 is its voice layering feature. This is great for playing at live performances. For example, say you are playing one of the piano programs and while you are playing you want the strings to accompany you; all you do is hold down the piano button you are currently playing and press the strings button and there you go! If you want to go back to solo piano, just press the piano voice button and you're back to one voice. We noticed when we switched from two to one voice, the voice we had turned off didn't abruptly cut out—instead it would gracefully exit. You'd be surprised how many keyboards on the market don't do this! Go Yamaha! What is a Yamaha digital piano without the electric pianos? Yes, thankfully Yamaha added electric pianos too. They are quite expressive and playable. From hammer-struck metallic tines to FM synthesized electrics, you will instantly remember hearing the same pianos used in Pop, R&B, and Jazz styles. 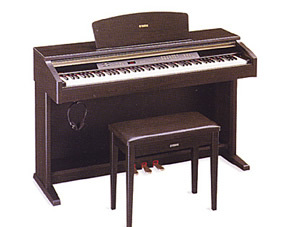 The Yamaha YDP223 also comes with a several organ programs that are great for Jazz and Church music, and among other voices including a vibraphone, a couple harpsichords, and choirs too. The YDP223 has a great feature for piano students. Fifty popular piano pieces from Mozart, Beethoven, Chopin, Schumann, etc are preloaded from the factory. When playing them back, you can mute the left or right hand parts so you can learn each part independently—this makes learning pieces a lot faster and easier. In addition, you can also set start and end points anywhere in any song, so, for example, say you've been having difficulty learning a particular phrase from Fur Elise. All you do is select Fur Elise and play it, then press the TEMPO/FUNCTION button at the start of the phrase you want to learn and press the TEMPO/FUNCTION button at the end of the phrase. This will set your start and end points and the YDP223 will now only play that segment and repeat it as many times you want. The Yamaha YDP223 has a two-track sequencer to record what you've practiced or to record any new compositions that you might have created. Recording is very easy; first press the REC button to engage, then select the track you want to record by either pressing the TRACK 1 or TRACK 2 button to start, and start playing. Press the REC or STOP button to stop recording. For the music students out there, the YDP223 allows you to set the time signature, tempo and metronome before you record giving you total control over your compositions. You can only save one user song on the Yamaha YDP223, however; you can back up and record your compositions to your computer via MIDI (with the appropriate software) or actually record them straight to a cassette deck. The Yamaha YDP223 gives you the ability to tweak your sounds. The BRILLIANCE slider allows you to adjust the timbre of your sounds from mellow, normal, or bright. The REVERB button allows you to adjust the type of reverberation by selecting from a hall, room or stage—it gives you the feeling of playing the piano in one of these environments. The YDP223 also has an onboard effects processor allowing you to add some phaser or delay, for example, letting you create different ambiences if you wish. The Yamaha YDP223 also has a touch control setting that changes the response of the keyboard from light, medium, to hard, an on-board metronome, transpose function, seven different scales to choose from, and a fine tuner to adjust the Yamaha YDP223's pitch in case you decide you want to play along with your favorite CD or another fellow musician. The best part of the Yamaha YDP223 is the piano sounds—they are so authentic and playable. They will inspire music to pour out of you. The other sounds are good but, it's the piano that makes the YDP223 sparkle. We didn't understand why Yamaha included a harpsichord program—maybe they were trying to appeal to Baroque music fans. We liked how easy the YDP223's sequencer was to use, the convenient BRILLIANCE slider, and the two 20W speaker system—enough powerful to keep up without distortion. We definitely think this digital piano is a great choice for a music student—it will build confidence and inspiration and it's fun to learn the on-board songs. From the quality of sounds, to the touch of the keyboard, and its price tag, the Yamaha YDP223 is an outstanding value and would make a great home digital piano for a family.